Dreamcoat FlooringBlogTired of Tire Marks Ruining the Appearance of your Driveway or Garage? Are you tired of tire marks on your driveway or garage floor? Tire marks in the driveway leave an unsightly blemish on what is often the first impression of our home, and take away from what could otherwise be lovely curb appeal. We do a lot to maintain our homes and our property value; we plant flowers, mow and water the lawn, maintain our doors, windows and home exterior. Nobody likes ugly tire marks taking away from all our hard work to improve the appearance of our home. Tire marks are basically pieces of rubber that get ground into the surface. Tires are made of plasticizers which contain different polymer compounds that make rubber tires more flexible. The plasticizers in tires serve many valuable purposes, they help tires to provide traction on the road, and keep them more pliable and flexible in cold weather. 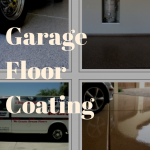 When these plasticizers heat up, however, from driving on the road or from the hot weather in Arizona, they tend to leach out and leave black rubber marks all over your garage floors or driveway. This can also happen when your car sits for a long time in one position. This is called plasticizer migration, and is even more noticeable with higher quality tires as opposed to the low budget variations, as higher quality tires typically have a higher concentration of plasticizers. It is usually possible to remove those unsightly tire marks from your garage or driveway, although some factors come into play that affect the ease in which tire marks can be removed. How long they have been there, how thick they are, and of course, what surface you are trying to remove them from make a big difference in the ease in getting rid of these tiresome tire marks. It is much easier to remove tire marks from a vinyl or epoxy coated and sealed floor, than from plain concrete, metal or other surfaces. With your epoxy coated floor, tire marks will usually come off by scrubbing with some soap and water. 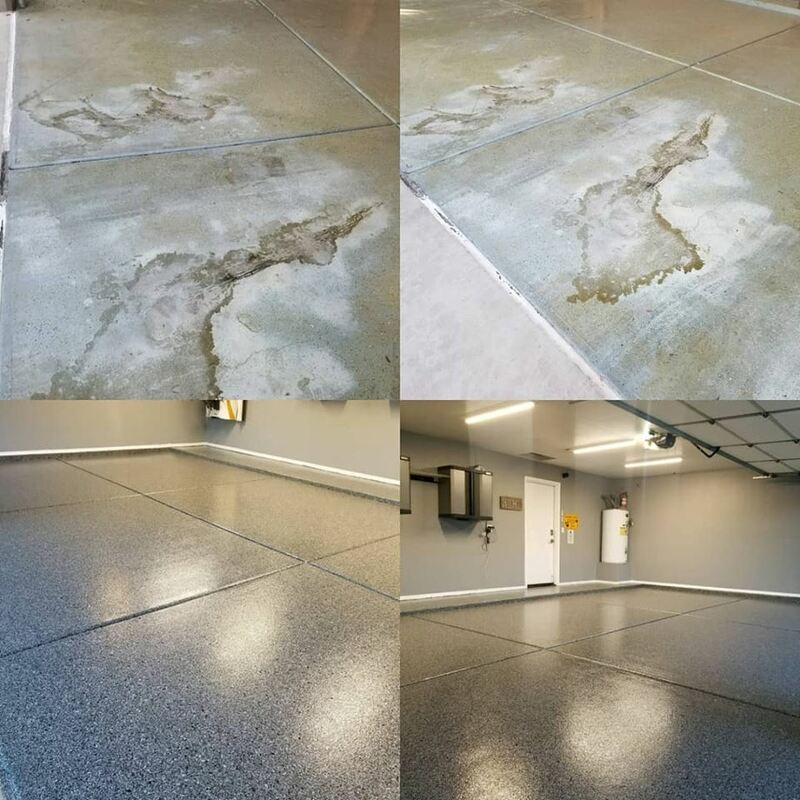 Non-epoxy coated surfaces pose additional challenges and are a bit more difficult to remove stains and tire marks. You can try a variety of solvents and be sure to follow manufacturer directions for use, safety and clean up. In some cases, a simple concrete degreaser might do the trick, depending on the length of time the tire marks have been there and how ground into the surface they are. Some other options for the do-it-yourselfer include various solvents and cleaners, that may work better with a pressure washer to wash away the loosened plasticizer pieces and the solvent. You’ll want to be careful, however, with chemicals and a power washer to not chip or damage a coated and sealed surface. If you are not the DIY type of person, or you simply do not want to waste time or money searching for the best way to remove unsightly tire marks, call on the flooring specialists at Dreamcoat Flooring. We are experienced at beautifying your floor space, no matter the surface or area. Our expert technicians are more like seasoned artists, offering a variety of colors, patterns, surfaces and coatings to match your décor and provide an alluring appeal. Not only do our concrete coating solutions beautify your space, they protect against damage from the harsh Arizona heat, moisture, cracks, blemishes, oil, stains and even tire marks. Why take the time to clean and protect your home, and leave your driveway, garage or patio unfinished? Our helpful flooring specialists will come to your home or office, and provide a FREE survey and analysis of your flooring needs, offering proven solutions with the most beneficial options to upgrade your non-coated flooring or concrete. 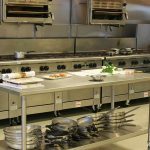 Dreamcoat Flooring is a leading concrete flooring specialist in the Phoenix area, transforming the floors and driveways of residential and commercial property owners for nearly two decades. Our high-quality concrete coatings are a vital component of home and commercial restorations or new construction. 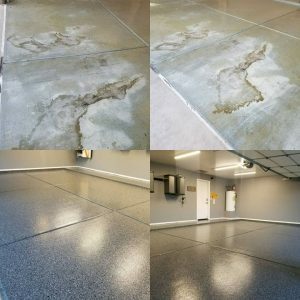 We provide concrete coating solutions to residential garages, driveways, patio and pool areas, and any concrete floor needing some TLC. Our residential flooring solutions include concrete coatings that enhance the décor and beauty of your home, while providing valuable protection to maintain and increase the value of your property. Our commercial concrete coating solutions provide numerous benefits in many applications including office and retail space, warehouses, showrooms, manufacturing facilities and even airport hangars. 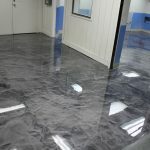 Our concrete coatings solutions are available in a wide variety of colors, patterns and coatings including Epoxy coatings, Epoxy Terrazzo coatings and Polyaspartic coatings. Dreamcoat Flooring provides artistic and beautiful flooring that will last for decades. Let Dreamcoat Flooring show you how to put a smile on your face every time you pull into your drive, and get rid of that pain in the neck cleaning job. 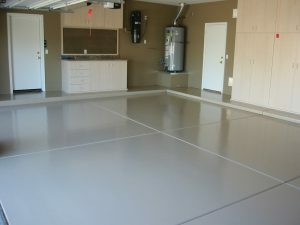 No longer will you be tired of tire marks with Dreamcoat Flooring concrete solutions. Dreamcoat Flooring is a leading concrete and flooring specialist, with proven solutions to improve the look and value of your home, while providing durable protection to reduce maintenance time and expenses. Contact us today for a FREE, no-obligation evaluation of your floor space and to speak with a concrete flooring technician for answers to all your flooring, driveway and concrete questions.